PHAT KRAPHAO KAI (basil stir fried chicken). My entire family can eat this everyday, literally everyday. Whenever we eat out, we have to order this dish otherwise my father and sister won’t feel “satisfied” or even eat. Unfortunately, I can’t join them on their passionate love for Kraphao Kai. I mean I do love it, but not eat-it-everyday kind. That is why to tweak it up for myself and enough to satisfy my dad, I made Kraphao Kai Kob. Kob is just fried/crunchy chicken. Dice boneless chicken and dip in Tempura flour, then onto breadcrumbs. This gives it the perfect crunch texture. Deep fry it. Place the oil in medium heat pan. Add the minced garlic and chilies. Stir until fragrant. Add the fried chicken and mix carefully. Keep the heat low, to not lose the crunch. 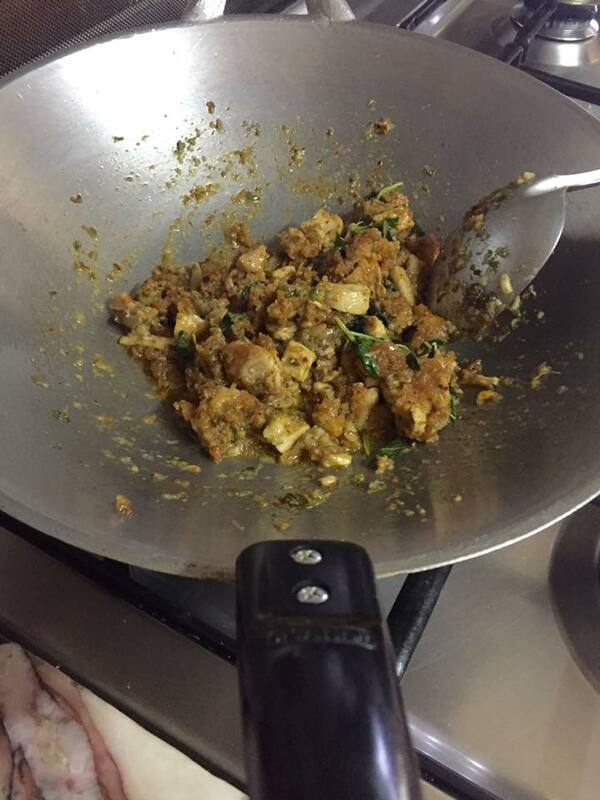 Add the mushroom, oyster and fish sauce and seasoning – salt & sugar. Mix carefully! Once it is mixed thoroughly, add the basil leaves and beans. Note – You can add the chicken at the end, to keep the crunch the strongest. Options for mushroom, oyster and fish sauce? You can try mixing soya sauce with anchovies fillets, then pour that in place of fish sauce.